Multicore processors are more important than ever in networking systems due to the shift to virtualized networks using software-defined networking (SDN) and network functions virtualization (NFV). Virtual network functions (VNFs) may be running on servers in the data center, on network appliances platforms at the edge of the network or on universal CPE (uCPE) systems at the customer premises. 2017 saw the introduction of many new multicore processor architectures and product families for both networking and data center applications. A key challenge for equipment manufacturers and service providers is picking the right solution for both server performance and network bandwidth. Service providers have new opportunities to deliver cloud-based applications and services. Cloud service providers such as Facebook, Google and Microsoft have dominated architectural developments for hyperscale data centers and are offering cost-effective services that challenge conventional telecom approaches. Communications service providers (CSPs) are running to catch up by replacing conventional telecom equipment with virtualized functions running on servers in large data centers, telecom central office locations or within the customer premises. Software-defined WAN (SD-WAN) and virtualized CPE (vCPE) are leading examples of virtualized CSP services already widely deployed. CSPs are using a mix of standard server platforms and carrier-grade server platforms such as the Radisys DCEngine. These platforms use general-purpose processors that are optimized for server applications with separate chipsets for networking I/O. The latest processors are implemented in 14/10 nm technology and integrate up to 48 high-performance cores. Intel has dominated this market with its Xeon E5 processors and has significantly improved processor performance for virtualized networking applications with the introduction of the Intel Xeon Scalable Processors. At the same time, AMD has re-entered this market with the EPYC series processors based on the new Zen core, and Qualcomm is shipping the ARM-based Centriq processor family. All three companies are planning future multicore processors using 7 nm technology. Integrated multicore processors have multiple processing cores, network interfaces and hardware accelerators for security, packet processing and network virtualization handling up to 100 Gbit/s. These processors are particularly useful for the virtualized network edge and other applications where systems must provide an optimal mix of packet processing and server performance. These processors are being used in network appliance platforms, uCPE, smart network interface cards (NICs) and other network systems. Integrated multicore processors with 8-72 embedded cores and dedicated hardware accelerators are being used in appliance platforms and virtualized edge applications. 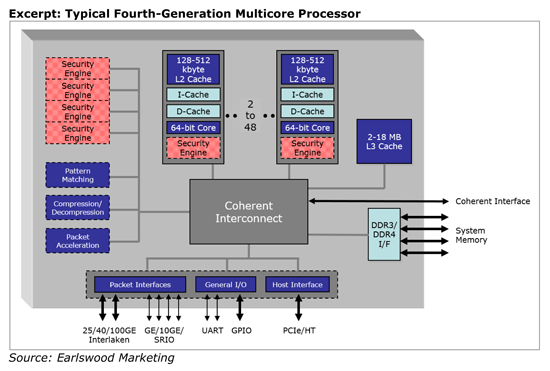 The excerpt below shows a typical fourth-generation integrated multicore processor. Multicore Processors Accelerating Network Virtualization: A Competitive Analysis surveys high-performance multicore processors for virtualized networking and other networking applications. The report also reviews the strategy, product mix and product architectures of multicore processor, intellectual property (IP) and software vendors. As such, the report not only provides granular information on the components themselves – of interest to chip manufacturers and purchasers – but also provides insights into how the overall market for multicore processors is likely to develop – of interest to a wide audience, including carriers and investors. This report covers 17 vendors, and uses information and product documentation supplied by these vendors. Interviews with most of the vendors covered were conducted during the second half of 2017. The report contains detailed information on almost 90 devices or groups of devices. The tables presented in the report were compiled using data provided during these interviews and from product documentation. Once the tables were compiled, the relevant data was provided to all the vendors for confirmation, feedback and updating. Multicore Processors Accelerating Network Virtualization: A Competitive Analysis is published in PDF format.